My uncle turned 65 at the end of July and we celebrated with a small dinner party at our house. The main course was such a big hit that I thought I'd share it here. We made what was essentially a stuffed, rolled pork shoulder with a side of pasta. This is an adaptation of a recipe found in Mario Batali's Holiday Food cookbook. 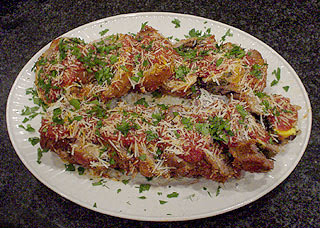 Braciolona Ingredients 3lbs of boneless pork shoulder or leg, butterflied and pounded to yield 1 large piece 1/2 inch thick and 12 inches square 1/2 cup plus 2 tbs chopped parsley 1/4 cup pine nuts, toasted 1/2 cup dried currants 3/4 cup freshly grated pecorino cheese 16 slices of prosciutto di Parma 4 hard-boiled eggs, peeled and sliced several gratings of nutmeg 4 tbs dried oregano 1/4 cup olive oil 2 red onions cut into 1/4 in dice 4 garlic cloves thinly sliced 2 cups of dry white wine 3 28 ounce cans plum tomatoes, crushed 2 tsp red pepper flakes 2 pounds of ziti, cooked Directions Lay the pork out flat and season with salt and pepper. In a mixing bowl, stir together 1/2 cup of the parsley, the pine nuts, currants and 1/2 cup of the pecorino. Season with salt and pepper. Lay the prosciutto slices over the pork piece to cover completely. Sprinkle the parsley mixture evenly over the prosciutto. 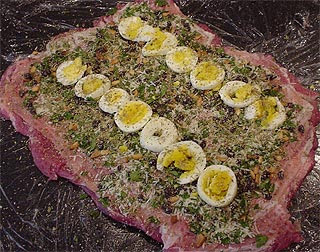 Arrange the eggs in rows across the meat. Grate nutmeg over the entire piece and sprinkle with 2 tbs of the oregano, rubbing t between your fingers to release the oils. Carefully roll the meat up like a jellyroll and tie firmly with butcher twine in several places. Season again with salt and pepper. In an 8 quart Dutch oven, heat the oil until smoking. Carefully brown the pork roll on all sides. This should take 15-20 minutes. Remove the meat and set aside. Add the onions, remaining 2 tbs of oregano, and the garlic to the pan. Cook until light golden brown and soft, 9-11 minutes. Add the wine, tomatoes and pepper flakes and bring to a boil. Return the pork to the pan and simmer partially covered for 1 hour 20 minutes, moving occasionally to avoid sticking. Transfer the pork to a cutting board and remove the butcher twine carefully. Slice the braciolona 3/4 inch tick with a very sharp knife. Arrange the shingles on a warm platter and sprinkle with the remaining 1/4 cup of pecorino and chopped parsley. Serve with cooked ziti. Firsty, I think your blog is terrific, and having spent years in Philly at Penn and working thereafter, I appreciate the taste of South Philly. I truly look forward to reading more. I'm trying the braciolona this weekend.